Spirit Lake Motorsports has a brand new 2019 TimberSled ARO 120, in Black, for sale. MSRP is $5,499.00. Now Starting at $5,199.00 after the new $300 Polaris rebate for the Spring Sales Event! This does not include your choice of Fit Kit-- Fixed Strut or TSS. ARO CHASSIS - The chassis is narrower, more agile and 11 pounds lighter, which enhances the handling and minimizes rider fatigue. The ARO Chassis also features a raised drive shaft to improve lift and gets the bike up on top of the snow quicker. ARO REAR SUSPENSION - Our new rear suspension combined with a raised driveshaft, allows the ARO to mimic the feel and performance of your dirt bike. The new suspension geometry delivers 30% more front track shock travel and 2” more overall suspension travel. The track approach angle is optimized for improved lift in deep snow. Comes with FOX® ZERO Pro® shocks. 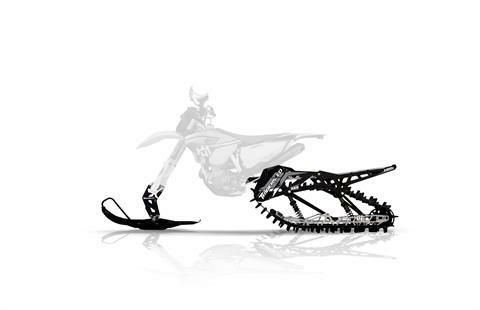 WHAT’S INCLUDED - ARO 120: 120" Traverse Track, Traverse Ski, EK X-ring chain, Spindle, Shielded Brake System. Requires TSS or Solid Strut Install Fit Kit. Please feel free to email or call for details. We have financing if needed. Let us help you get into the new machine. We are always here to help. We don't only sell machines, we ride them too! The parts dept. can help you get your bike ready for winter riding! Hand warmers, Extra gas storage, bags…whatever you need. Price valid for Cash or Standard Financing deal, with qualifying credit. Tax is not included in the above pricing.